GOLDSBORO -- The Rev. William Barber walks gingerly with a cane, in a hunched-over posture, yet here he is on a recent Monday, leading 3,500 protesters on a downtown street. He says God must have a sense of humor to call on a man who has such difficulty walking to lead the Moral Monday protests that began in North Carolina two years ago. Barber's speeches and his throwback tactics - in vogue again following several deaths of black men at the hands of police - draw comparisons to the Rev. Martin Luther King Jr. More than 1,000 demonstrators have been arrested for civil disobedience in North Carolina since Barber, president of the state NAACP, started the legislative protests. The demonstrations have spread to at least half a dozen other states and given him minor celebrity status. Supporters wear "I went to jail with Rev. Barber" buttons. Barber has been jailed five times himself. "What I know is what we are in is a time when we can't afford to be silent," Barber said, perched against a tall stool in his office at his church in Goldsboro. "We are battling for the soul and consciousness of this country." The protests target conservative politics and Republicans, who took control of the North Carolina Statehouse and governor's office in 2013, and cover everything from redistricting to labor laws to women's rights, gay rights and the environment. Moral Mondays are the legislative protest piece of the broader Forward Together movement led by the NAACP, which is in court over the state's new voting law and will be back in court next month to challenge redistricting. Detractors accuse Barber of grandstanding or say he is continuously repeating himself and not worth their time. A former state senator once called his movement "Moron Monday." His supporters say his leadership is reminiscent of both King and Ella Baker, who helped form the Student Nonviolent Coordinating Committee in 1960. "I think he's tremendously courageous," said Eddie Glaude Jr., a religion and African-American studies professor at Princeton University. "He's concerned about the state of black America, the state of brown America. He's concerned about the LGBTQ community. He's concerned about the most marginalized." Scholar and civil rights activist Cornel West, who is friends with Barber, describes him as "the only King-like figure we have in the country right now." "I have just been overwhelmed by his intellectual and spiritual power," West said. To understand Barber's desire to help the disenfranchised is to know his father's influence. Almost every story Barber tells somehow references Buster Barber, who would point to Jesus' first sermon, when he said he had been anointed "to proclaim good news to the poor." "And my father was very clear that to be Christian, to follow Jesus is to be concerned about the weightier matters of the law, of justice and mercy," Barber said. He was 4 years old when his parents returned from Indianapolis to his father's roots in eastern North Carolina, called there by local leaders who wanted their help with desegregating the schools. His father, now deceased, was an educator and minister, and his 81-year-old mother has worked as a secretary in schools. Students once called his mother the n-word, Barber said; now their children and grandchildren call her Mother Barber. He took his parents' lessons about equality to heart, becoming the first black student elected alone as student body president of Plymouth High school; previously, a white student and a black student had shared the position. He understood the value of education and got a doctoral degree. He can speak thoughtfully and quietly, quoting the Bible, the Constitution and poets, or he can jump and shout, and he often does during speeches. Willie Jennings, a professor at Duke University, is one of Barber's closest friends. They got to know each other when Barber was getting his master's degree in divinity at Duke and Jennings was a doctoral student. "William has, for many years, even before Moral Monday, he has always spoken to people with power, whether they be political figures, military," Jennings said. "He has always spoken to them and challenged them to give account of how what they do will help poor people." Poverty wasn't merely a lesson in the Barber household; it was a part of the family's life. His mother, Eleanor, recalls when Billy - his nickname - was in sixth grade and came home in tears because other children were making fun of his shoes. They were called "bobos" - off-brand versions of then-popular Chuck Taylor sneaker by Converse. The Chuck Taylors "screeched" as they gripped the basketball court. The bobos just slid out from under you, Barber said. Barber's paying job is as minister of Greenleaf Christian Church in Goldsboro. 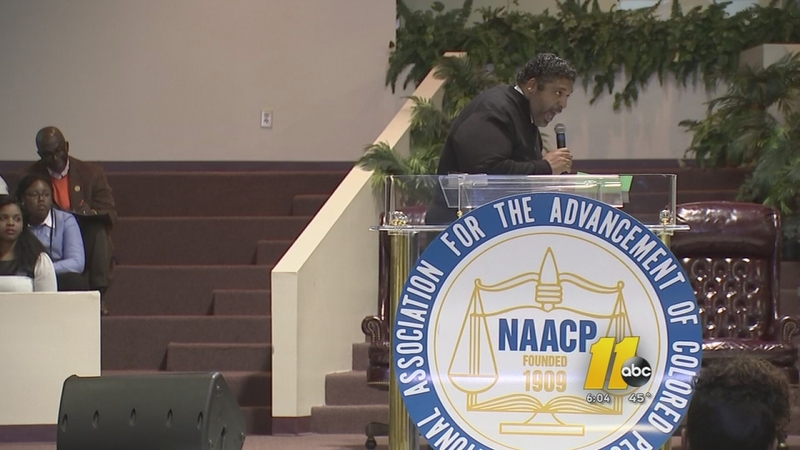 The NAACP doesn't pay him for his work as state chapter president or as chair of the political action committee of the organization's national board. He has no set speaker's fee, although he sometimes gets paid for speeches. He also will talk to groups that can't afford anything but his transportation. He and his wife have five children; because of death threats, he shields them from reporters. His difficulty walking isn't the result of his weight - he's lost 150 pounds in recent years and is trying to lose more - but of an inflammatory disease that also causes a bend in his neck that gives him that hunched-over appearance. Among Barber's supporters is Leslie Boyd, 62, of Asheville. She has been arrested twice and estimates that she's attended about 80 percent of Moral Monday events. Her impetus is the death of her son, who was 33 when he died of colon cancer in 2008. He might have survived if insurance has allowed him to have a colonoscopy every year, she said. "He just struck me as somebody who was going in the right direction, and I wanted to go with him," she said of Barber. "He's an amazing leader. He's just a wonderful human being. ... He stands up and speaks out where he sees things that are wrong." The GOP leadership and Barber get under each other's skin more than either lets on. The best-known criticism of Barber came two years ago, just after the Moral Monday protests had started, from then-Sen. Thom Goolsby, who wrote a column referring to the movement as "Moron Mondays." More recently, state Republican Party leaders set up a website accusing Barber of taking money from unions. Barber does speak to unions and supports their efforts. Two GOP leaders declined to be interviewed about Barber. A spokeswoman for Senate Majority Leader Phil Berger wrote that Barber "has been making the same claims for years now - and this point in the legislative session, we simply don't have time to respond." Barber resists calls to raise his national profile, believing change in the country starts in the South, where his parents brought him more than 40 years ago to fight segregation. He'll stay in North Carolina and fight, just as they did. "We can overcome the crippling realities of our current moment because when you come together, things can be changed," he said. "This kind of prophetic hope is not the kind that sets you to peace; it's the kind that stirs you to action."